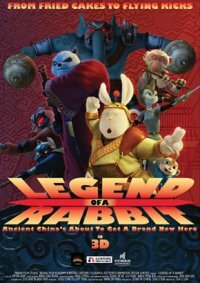 Featuring a variety of anthropomorphic animals and kung-fu sequences, Legend of a Rabbit had a budget of RMB120 million ($18 million), required 500 animators, and was in production for over three years. One day, a dying Kung Fu master flees from the Imperial City to a small village. He’s been betrayed by his number one disciple and is on his last dying breathe. He is found by a humble farmhouse cook named Tu who, at the request of the dying master, must return a very important Kung Fu Academy Tablet to the master’s daughter Peony in the imperial city. Tu made a simple promise that turns out to change his life forever. Never having been to the city, Tu already got off to a dangerous start. He finds the Kung Fu Academy but finds that it has already been taken over by the number one disciple, a ruthless bear named Slash. The old master and his daughter has gone missing. But to keep to his promise, Tu has no choice but to stay in the Academy to wait for their return. He’s bullied from day one for knowing no Kung Fu. But serving as a cook there, he picks up some Kung Fu as the days go by. At the imperial city he meets a mysterious girl (Peony) who keeps herself anonymous to keep her own safety. Rabbit never knew that this girl is the one he’s supposed to pass the tablet to. After many misunderstandings, they finally are able to connect – but not before the big bad villain Slash decides to kill Peony and Tu for intervening with his evil plan to take over the entire China. So it's a Chinese rip-off of Kung-Fu Panda? That being said, animal characters and kung-fu are a combination that I like seeing - so long as they have some good action scenes, it probably won't be a waste of film. Ugh, just watched the clips. The movement of the characters is not very smooth, a bit too high a framerate (we'll see if that is the clips themselves or if that's the reality for this movie). The poster art in this post didn't look too bad but in the clips themselves I am definitely not a fan of their design. Apparently in that universe animals can be any height or physique, at least in Kung Fu Panda their species did carry some general similarities to their real world animal counterparts (the whole point of the kung fu mastery was that physical 'limitations' didn't matter for ability). The movie is at best direct to dvd, very questionable quality and the story is far from original. Who knows if there is any sort of character development or dialogue worth listening to. I went looking for clips - this page seems to have pretty high quality video, but it only plays for about a minute before getting stuck. Underneath it looks like there are thumbnails to more clips. Otherwise I found lower-quality YouTube trailers here, here, and here. Still sounds better than Chop Kick Panda. Yeah, it's a rip-off, but it's not like Dreamworks has never done the same thing. Antz, I'm looking at you.